July 16, 2017 – National Corn Fritters Day – Day 249 P.E (Post Election). Senator Mitch McConnell (R-KY) unleashed his new health care plan this week, which features an amendment from Ted Cruz (R-TX). This version is basically the same as the prior version, which would gut Medicaid, eliminate protections for those with preexisting conditions, and leave millions without insurance. However, now with the Cruz amendment, the bill would also allow insurance companies to offer junk insurance policies, which would provide almost no actual insurance. 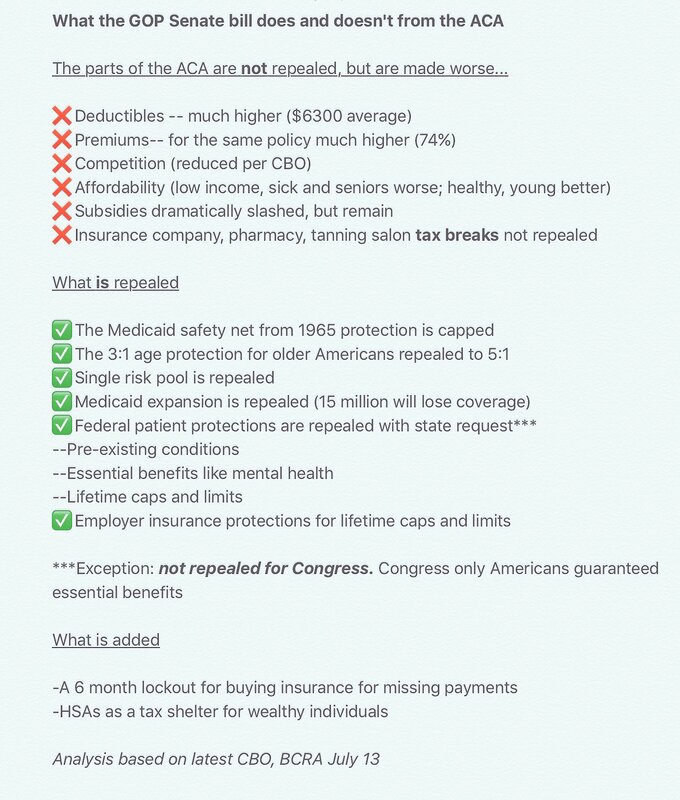 See the bottom of this article for a handy summary of the bill in comparison to the Affordable Care Act from Topher Spiro of the Center for American Progress. At this moment, it’s not clear whether McConnell has the votes to pass this bill that not even 25% of Americans support. To pass the bill, he can only afford to lose two votes and well, he’s already lost them. Senator Susan Collins (R-ME) is voting “no” because the bill is too cruel. McConnell’s fellow Kentuckian Senator Rand Paul (R) is voting “no: because it’s not cruel enough. We will have to wait at least a week to see if McConnell has found the Goldilocks level of cruelty. He pushed back the vote for a week because Senator John McCain (R-AZ) underwent surgery for a blood clot this week – leaving McConnell with just 49 possible “yes” votes. Congratulations to McCain, by the way, for finally finding a way to slow down Trump’s agenda. Bribing Senators – The latest version of the bill has a “Polar Payoff” or, if you prefer, a “Kodiak Kickback” or, if you prefer “Hell of A Lot of Money for Alaska”, which is an attempt to buy the vote of Republican Senator Lisa Murkowski. Lying Very Very A Lot – Vice President Mike Pence said to the National Governors Association conference, “Let me be clear . . . [T]he Senate health care bill strengthens and secures Medicaid for the neediest in our society.” There is no dispute that it actually cuts Medicaid dramatically – the Congressional Budget Office (CBO) concluded that 15 million people would lose Medicaid coverage. Also, Pence told a story about long wait lists for Medicaid in Ohio, the home state of Republican Governor John Kasich, an opponent of the Senate plan. Kasich’s staff responded that the story is also a complete fabrication. Putting Their Head in the Sand – Republicans may vote for the latest bill without a score for the Congressional Budget Office because they “forgot” to submit the Cruz amendment to the CBO. They would rather go with “we’re incompetent” than have a nonpartisan analysis of their bill. Channeling Bill Murray – McConnell has been trying to get moderates on board using the “it just doesn’t matter” argument, telling them to vote for the Medicaid cuts because they’ll probably never actually happen anyways. This week we’ll see if any Republican has the guts to be the third “no” vote, scuttling the bill. If so, look out for several more Republicans to come out against soon after and jump off this Norovirus-infected ship. This week we learned that Donald Trump Jr. may have made a huge mistake. Last Saturday, The New York Times reported that Donald Trump Jr. (whom I shall call “Don Don” from here on out to make it less confusing), Trump campaign manager Paul Manafort, and son-in-law Jared Kushner met in Trump Tower with a Russian attorney who could be described, at the very least, as Kremlinphilic. Sunday: Oops, the meeting wasn’t about adoptions, which is surprising given Don Don’s past work as a humanitarian. It was rather held in hopes of discovering some dirty borscht on Hillary. Tuesday: Don Don rats out . . . himself. In order to get ahead of The New York Times, Don Don released his personal emails, moments before the Times. These emails show he told a publicist for a Russian musician who is friends with the Trumps that he’d “love” to meet with the Russian attorney and that he really really hoped that she had some secret info on Hillary Clinton. Thursday: We learned that Jared Kushner on his first federal security clearance form did not list any meetings with foreign agents. Then he amended it and added over 100 meetings. Any omission is grounds for a felony charge. Here’s the kicker – it took a third revision, on June 21, for Kushner to finally list the meeting in question. Friday: NBC reports that there was another person in the room where it happened, Rinat Akhmetshin, a Russian-American lobbyist and alleged former KGB officer. Friday Night: Don Don’s attorney called NBC back and oops, there was someone else in the room too – possibly a translator. Don Don did an admirable thing! Trump spokespeople soon circled the wagons, declaring Don Don as a beacon of government transparency for releasing the emails . . . minutes before The New York Times was about to. It was Obama’s fault! The Obama administration should not have let the Russian lawyer into the United States in the first place. It’s the Secret Service’s fault! Don Don’s lawyer argued this morning that the Secret Service should have stopped the Russians from meeting with Don Don if they were such unsavory characters. First, Secret Service agents aren’t babysitters. Second, Don Don didn’t even have Secret Service protection at the time. Donald Trump didn’t know about it and he wasn’t even there! Trump associate and former campaign manager Corey Lewandowski said that Donald Trump was with him in Florida the day of the meeting. That is a lie – Trump was in Trump Tower too. Other Trump team members stated emphatically that Trump knew nothing about the meeting. However, like son like father, Trump himself poked a small hole in that story. Aboard Air Force One, he told the press “In fact, maybe it was mentioned at some point,” but that he wasn’t told the meeting would be about dirt on Hillary. Interestingly, the White House left that statement out of the official transcript of the press meeting. Cheryl Stanton, Trump’s expected pick to be the chief of the Wage and Labor division of the Department of Labor, was named in a lawsuit last year for failing to pay her own house cleaners. The Congressional Budget Office said this week that Trump administration’s proposed budget overestimates economic growth by $3.4 trillion dollars. Startup Visa Shutdown – The Trump administration put the brakes on the launch of an Obama era program that would allow immigrant startup founders to stay in the U.S. while their company grew. This is a direct affront to Silicon Valley — the place and the TV show. Voter Self-Suppression – Last week, I mentioned that states were pushing back against Trump’s bogus voter fraud commission. However, it looks like the commission is already having its desired effect. In Colorado, Florida, and North Carolina, voters have been calling to take their names off of the voter rolls. Trump’s threat to investigate all voters has caused thousands to voluntarily give up their fundamental right to vote. Imagine What Gon’ Happen When You Try to Tax Our Whiskey – Apparently learning nothing from the Vice President’s visit to Hamilton, the Trump administration is threatening American whiskey. Conventional wisdom is if Trump puts a blanket tariff on imported steel, the EU will respond by putting a tax on bourbon. And Trump’s Heart Grew Three Sizes That Day – A (good!) update on the sad story from two weeks ago of the all-girl robotics team from Afghanistan who had their visas denied to come to a competition in the U.S. Apparently, Trump intervened and now they have their visas! Trump is getting a lot of kudos for doing this. Although, since his policies likely caused the girls’ denials in the first place, I’m going to hold off on the canonization. A Mind is a Terrible Thing to Waste – This week’s latest reminder that we’re living in different realities is a Pew Research Center survey in which 58% of Republicans said that colleges negatively impact the United States. Just two years ago, 37% of Republicans thought colleges were detrimental to the U.S. For comparison, only 18% of Democrats thought colleges had a negative effect on the country. The Republicans are now anti-college, except, I imagine, for SEC football. French (Dis)connection – Trump traveled to France this week, and managed to embarrass himself and the United States upon both his arrival and his departure. Upon his arrival, he met French President Emmanuel Macron’s wife. Apparently, unable to do anything but objectify women, Trump said to Brigitte Macron, “You’re in such good shape. She’s in such good physical shape. Beautiful.” On his way out of Paris, he had one last tango with Emmanuel Macron. In a prior meeting, Macron had, for a lack of a better term, out-handshaked Trump. Trump was so upset about this that some believe it was the reason that he pulled the U.S. out of the Paris Agreement on climate change, thus threatening the existence of humanity. Anyways . . .Trump wasn’t going to lose this time! Trump and Macron had a 29-second handshake! Neither would relent and held on like two bald eagles mating mid-flight. She Who Has the Last Laugh – A judge threw out the jury verdict against the woman who had the unmitigated temerity to laugh during the confirmation hearing of Attorney General Jefferson Beauregard Sessions III. The judge has ordered a new trial. Sessions may decide that this is too big of a distraction from his work to deport immigrants and threaten voters, so he may not push to try the case again. On the other hand he’s a really terrible person, so he may find the time to squeeze it in. Since the story of the week is Don Don and his Russian entanglements, the article of the week is fromThe New York Times on “Donald Trump Jr. and Russia: How The Times Connected the Dots”. The runner-up article of the week is from The Washington Post’s conservative columnist Jennifer Rubin. She reflects on “The GOP’s moral rot is the problem, not Donald Trump Jr.”. Itching to get closer to the front lines? 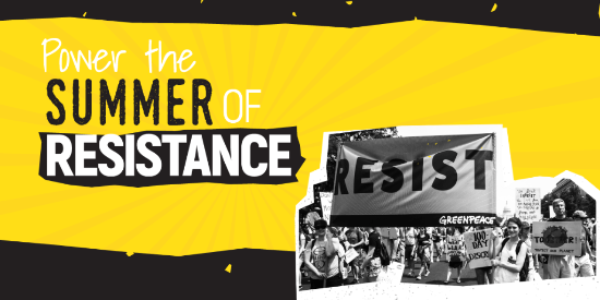 Sign up for a Training in Non-Violence Resistance from Greenpeace near you!